Now, more than ever before, healthcare organizations have the ability to transform patient experience and clinical communications through the use of Apple devices. Want to know how? 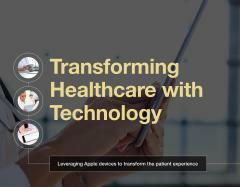 In this e-book, you’ll discover ways iPad and iPhone help hospitals deliver better patient outcomes while allowing caregivers more time at the bedside. Take a few minutes to peruse our e-book and see how the right technology tools greatly enhance the healthcare experience for patients and their care teams. Please fill out the form below to download the e-book.